Polka Dot Overload | Sewing, knitting & vintage projects, tips, tutorials and cartoons! : Polka Dot Muslin! With only 11 days to go in the PatternReview mini-wardrobe contest, I finally have one finished... muslin! I started with a size V (intended for a 35" bust) based on my high bust measurement and flat pattern measurements (I compared to some favorite Ts I still wear) and the fact that I tend to like my knit tops close-fitting. From my flat pattern measurements, it seemed like this would result in a final 36" bust measurement. 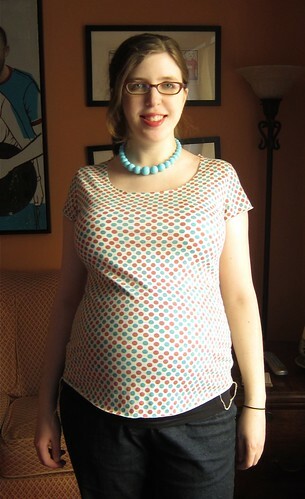 I used less than a yard of the rayon/poly/lycra orange-and-teal polka dot jersey I got recently from Fabric.com. It has 40% one-way stretch, which is close to the 50% stretch of my ITY jersey B&W polka dot fashion fabric. So what's the verdict? Mostly I'm happy, but I'm glad I made a muslin first. The shoulders fit! This is fabulous, since I have narrow shoulders and many reviewers have complained that the larger sizes of this pattern have silly-wide shoulders. Hurrah for my new scooped neckline! Just the right width and depth--it won't show my bra, but leaves plenty of room for a necklace. I do like negative ease, but the polka dots are actually distorted across the bust, so I think I'll add another half inch (1" total) to my FBA. The belly adjustment wasn't quite enough, either--it's a bit too short for my liking (especially since I want to twin-needle hem the final version!) and it's pulling a bit across the tummy. I'm digging the new shorter sleeve length--I was going to make the final in a 3/4 sleeve, but this might be more fun. 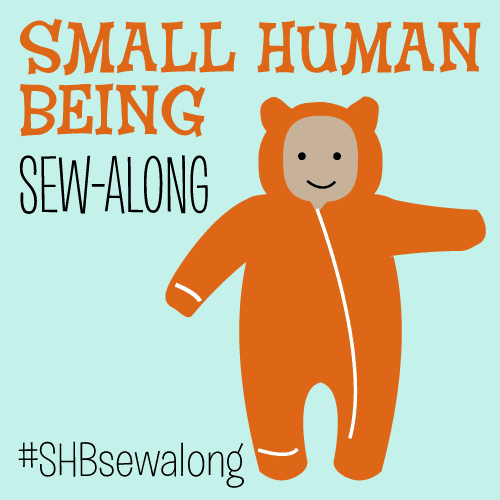 And it'll be even a little shorter when hemmed. What is up with this tiny little armhole?! I'll have to enlarge it a bit. As for the back... well, all my RTW shirts and dresses crumple/wrinkle like that, too--I believe this is what as known as sway back. I'm not going to add a center back seam in order to fix it, as I just don't think it matters enough in a knit top I'll only be wearing for less than 3 months (I'm due June 18). But not until AFTER I finish the final version for the wardrobe contest. 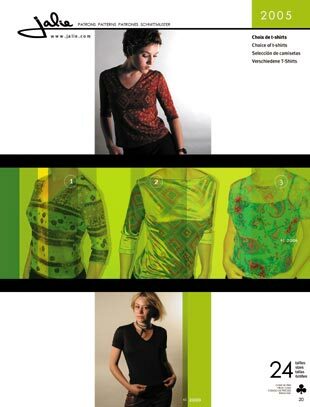 Ah, I am very happy to read your post, as I have been sitting here sticking together 72 pages to make up the pattern for the very same Jalie tee (hopefully you have the original pattern from before it went OOP ... taping all the bits of the download together is a bit of a pain in the you-know-what). Your tee looks really great. Its interesting seeing how you have made the alterations. I am trying to see in the photo if you did the FBA by adding a dart? I am undecided if this is what I should do (for a similar bust size, though sadly not because I am pregnant!). Look forward to seeing the whole mini-wardrobe. Good luck! No dart (well, not exactly!). The FBA created a big old dart, but I used the FFRP method of removing it at the side, as I like to avoid darts in knits when I can. I just eased the extra fabric created into the back seam. I'll have pictures later today of how I did it! And yes, I bought this pattern ages ago, so I didn't have to download it, although I did trace it since I'd like to use it post-pregnancy. I vote a yes on this one. I agree about the back adjustment, totally not worth it for a short-term top that looks pretty darn good anyway. Love the neckline, it's perfect! 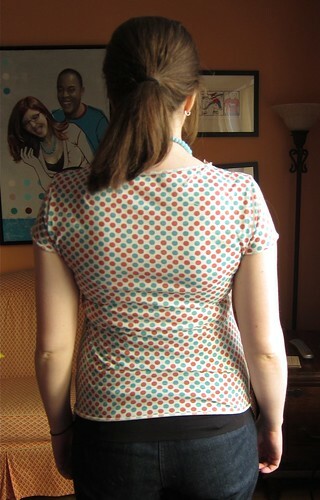 Cute polkadots, they make it a really fun and spring-y top. I think the fit is absolutely wearable, although I can imagine you'd want to make the next one a bit longer. 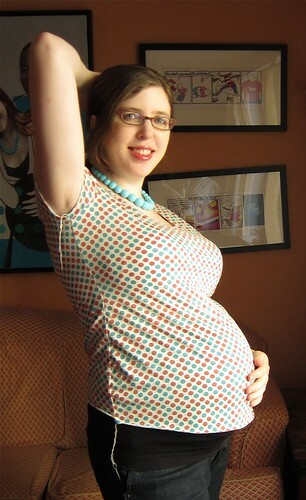 Not because I think it doesn't look good, but because I remember I loved wearing a bit longer tops when I was pregnant. Somehow during my pregnancies really short maternity tops were in fashion, and I hated that! Good combination with the necklace by the way! Your changes look fantastic! The neckline and that length of sleeve are really flattering on you, and your baby looks nice and comfy. I want to steal your necklace too! I've been searching for that color for ages now. Ooo... I love the print on the top! Great job on all your efforts!